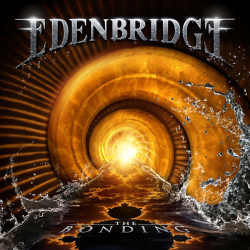 Austria’s most popular symphonic metal band Edenbridge took three years to come up with the successor The Bonding after their last album Solitaire. The main cause for this was the suicide of Lanvall’s father, which took quite some time to process. Other reasons were the hiring of a new bass player and a crowdfunding project which helped the band to employ the services of the orchestra Klangvereinigung Wien. The opener Mystic River surprises instantly with unusually heavy sounds which immediately grabbed my attention. Edenbridge show masterfully that their mainly melodic metal can still have some rough and unpolished edges. This is followed by Alight A New Tomorrow, the CD’s shortest song which feels as carefree and catchy as their previous hit Higher, and therefore it’s no surprise that the band made a video clip for this track. Four songs on the album deal with the death of Lanvall’s father, done stylistically with feelings ranging from grief to anger. Star-Crossed Dreamer and Death Is Not The End both are quieter pieces, and I have to admit that I don’t appreciate that side of Edenbridge so much, even though I accept that these elements are a fixed part of the quintet’s nature. Shadows Of My Memory is a surprisingly brutal track which premieres male vocals, courtesy of the new bass player Wolfgang Rothbauer who used to be in German death metal band Disbelief. Into A Sea Of Souls is another of the band’s sadder songs, displaying the band from a melancholy side that works quite well for them. Sabine Edelsbacher has become a very self-confident front woman over the years, and it is no longer necessary to compare her talents to other singers. The opposite is rather the case. Her clear voice has matured considerably, and also she manages to do without any exaggerated high parts. The album concludes gracefully with the epic quarter hour long title track, a lively piece of music full of mood changes that should even appeal to progressive metal fans.